The world of private jet travel, holidays on the deck of a superyacht and a Lamborghini in the garage is no longer exclusively for the mega-rich. As paying monthly for goods and services becomes increasingly popular - from Spotify, Netflix and your phone contract, to cars on finance - the luxury end of the market is also starting to play ball. Blame it on the Instagram generation if you like, but it’s now possible - and easy - to rent yourself a luxury lifestyle for a fraction of what owning a jet, a yacht, or a Ferrari would normally cost. Yes, you still need five figures of spending money per year - more, ideally - and yes, you could argue this is cheating slightly, but who could say no to a private jet on the cheap? Here is the T3 guide to renting yourself a luxury lifestyle. Does anything say you’ve made it in life more than a private plane? Okay, so technically we are hiring someone else’s plane and pretending it’s ours on a dozen Instagram photos. But in some cases - you need to get somewhere obscure at very short notice, or you just fancy treating yourself to something far more exclusive than first class – private jet chartering makes perfect sense. It’s a growing industry too, as chartering firms describe themselves as the ‘Uber of private jets’, where smartphone apps secure you a jet with just a few screen taps. Also worth remembering are extra fees like de-icing before take-off on a cold morning, which can add thousands to your booking. With access to over 7,000 planes worldwide of almost any shape and size, Victor is something of a one-stop-shop for aviation charter. As well as offering planes a-la-carte, Victor operates so-called empty legs, where you can bag a ride on a private plane while it is being moved to where its owner needs it, saving you money. You’ll be looking at around £5,000 to £10,000 one-way for most Western European destinations on a small business jet, which works out at around £1,300 per seat. For something a little more varied than your standard business jet, try Privatefly. This web- and app-based service offers everything from regular airliners and helicopters, up to a ‘VVIP’ Boeing with seating for 30. You can even book a 180-seat Airbus A321 - you know, the kind of plane you’d catch from Gatwick for a holiday, but all for yourself. Stratajet is another web-based booking system. It's a super slick process, with instant price quotes (not estimates) and instant booking. You can choose your origin and destination, see total travel time and discover airfields that save you time and money. There are no subscription fees, and Stratjet's patent-pending technology efficiently reschedules empty aircraft to your route – helping you get the cheapest flights possible. 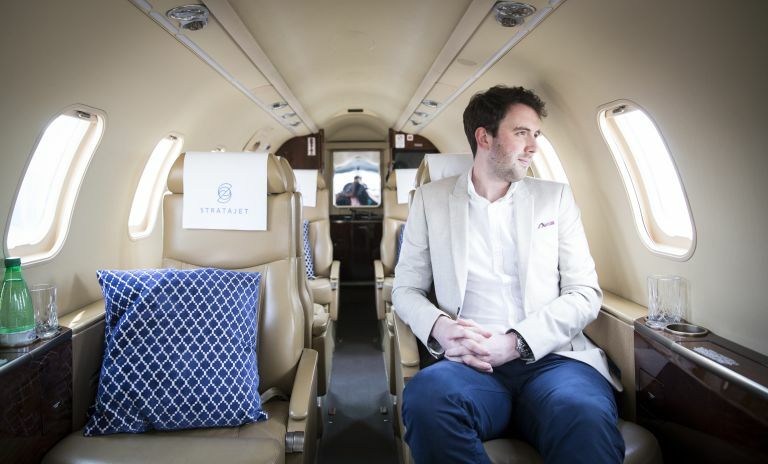 Customers of Stratajet range from teenagers to octagenarians, and a third of its passengers are first-time private jet fliers. Between 30-40% of Stratajet’s bookings are families travelling with children, too. Charting yourself a superyacht isn’t quite as speedy as booking a private jet (gap in the market, maybe? ), but there are still plenty of options for stepping aboard something truly luxurious on your next holiday. For starters, you can bag yourself a Riva Aquarama - the quintessential speedboat - from a range of companies for around £1,200 per day or £750 for a half-day on Italy’s Lake Como. Considering these boats can cost over £200,000, a slice of the lifestyle for under 1% of the sticker price seems like a deal worth making. Stepping things up a gear, entry-level charting firms like Moorings offer compact 13 to 15-metre yachts in the Mediterranean, Caribbean and elsewhere for between £4,000 and £10,000 per week. Just don’t forget to add food, drink and mooring fees on top, as these are often not included in the base price. Founded in 1947 and US-based but with an office in London’s swanky Mayfair (where else? ), Fraser offers new-builds and yachts management, but also chartering of superyachts and megayachts for any budget. Okay, not any budget, as prices start at around £26,000 a week for a 27 metre yacht with space for six guests, three crew and a Jacuzzi. When chartering a yacht it’s important to consider the knowledge of the crew, as well as what facilities the boat has to offer. You’ll want a crew who knows your chosen area well, so they can suggest the best places for diving during the day and dining in the evening. You should also look into a yacht’s ‘water toys’ - these are extras like canoes and water skis, but on larger yachts can include several speed boats, jet skis and even a submarine. The fuel for these - and the occasional helicopter - is usually not included in the charter price. Construction began on Camper & Nicholsons’ Portsmouth shipyard in 1782 and the company itself was formed in 1863, so it’s fair to say they’ve been in the yacht game for a while. C&N offers new-builds and sales, but also chartering - so you can bag yourself a week of rented luxury to show off in the Med (or just on social media). You’ll be looking at the thick end of £100,000 a week for something serious, but when you bear in mind that is for a 12-berth yacht, the cost is really £8,300 each for the week. That gets you a 43 metre vessel in the form of the Eclipse, which has 10 crew members, six double cabins and three jetskis. Dare to dream a little bigger, and the cost of chartering much larger yachts can quickly reach the heady heights of £1m a week. It’s all well and good having a fleet of exotic supercars in the garage, but isn’t taxing, insuring and servicing them just a massive faff? We think it’s much easier to join a supercar rental club, where you pay an annual membership fee for points which can be redeemed against a range of cars. The more expensive and exclusive the car, the more points it costs to borrow for a day or a weekend. Most clubs offer a range of vehicles, from Range Rovers through to the likes of the Audi R8 and Ferrari California, right up to supercar royalty like the Lamborghini Aventador. The current fleet includes an impressive range of today’s finest supercars, including the Ferrari 488 GTB, Lamborghini Aventador S Roadster and Huracan Performante, McLaren 720S and 570 Spider, and a Honda NSX. Membership starts at £13,500 plus VAT per year and gets you 1,000 points, which Auto Vivendi claims is good for an average of 24 rental days annually. This depends a lot on the kind of vehicle you want, however, as while a tier one Range Rover is just 25 points per day or 130 for a three-day weekend, a tier nine Lamborghini Aventador is 65 per day or 250 for the weekend. Mileage is capped at 50 per day, then charged at up to one point per extra mile. The most expensive annual membership costs £33,500 plus VAT and comes with 2,500 points good for an average of 60 hire days per year. Rotate Club offers a similar points-based system, but with prices starting from £6,000 plus VAT for 1,000 points and topping out at £28,000 plus VAT for 4,800 points. Mileage is a more respectable 100 per day, while the daily cost of cars spans from 35 for a Range Rover, up to 260 for a Lamborghini Aventador S Coupe. Other vehicles for hire from Rotate include a Ferrari California T, Bentley Continental GTC, and an Audi R8 V10 Spyder.